I believe that hands can tell a story. I believe that time is an enemy and a friend, but when living on the streets it can be elusive. I believe that a moment to tell a story can be a precious gift. I believe that doing paperwork feels unnecessarily formal after the harrowing experiences some of our guests endure. I believe that free water can heal both physically and mentally. I believe that it is worth making time for our guests to have a comfortable place to sit and think. I believe that a brief hug or handshake is a thank you worth a thousand words. I believe that happiness is like a spirit, fighting to be seen and felt everywhere. There are many things that I have come to believe since I started working at the OAC. It is hard for me to pick a brief moment in time from this year to share. For me, when I think of serving at Central OAC, experiences flash in my mind from many different interactions. I see the faces of those I’ve worked with and hear their voices as they tell me their stories. The big focus for me is on guests and their stories. All people deserve to know they are seen, but when you are marked as a “person in need”, many people turn their backs, or avert their eyes. We all know this, and yet all of us find ourselves doing it in one way or another. That’s why it’s all about stories. When you see someone who looks like they may be in need, remind yourself that they have a story, and they are human. Everyone deserves to know that someone believes they have value. I believe that everyone has value. Make space for people in the ways you are comfortable, and then try to see if you can make space in ways that make you uncomfortable. The program I’ve been serving through, Young Adult Volunteers, focuses on being uncomfortable, and when we find ourselves getting comfortable, the program encourages us to find ways to be uncomfortable again. Not worrying about your own comfort can make you more able to fully care for other people. I have to admit I have found myself comfortable in some of the parts of my work at Central, but I assure you, there is a time every day, that I experience discomfort. I consider it a great gift. I take a deep breath, and then dive in. A little over a year ago, I never would have thought I could do that, let alone learn to love it. I have found a passion in this place, a passion that is shared by the staff and volunteers, a passion for seeing those who often go unseen, hearing the stories and understanding the humanity of those who are rejected or seen as valueless. 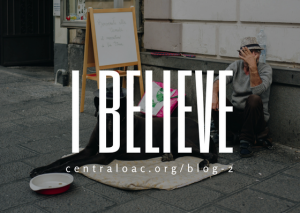 Central OAC is about helping people to help themselves, building back some confidence, and showing people their inherent value along the way. As I prepare to leave, I can only express my gratitude to Central OAC for teaching me how to have humility, compassion, patience, and kindness for everyone. I feel God in this place, every day. Cat is our year-long intern and will have her last day with us at the end of July. We’ve loved having her on board at the OAC, and we can’t wait to see what she’ll accomplish next!